If you love reading books and hate hearing people telling you to put that book down, now you have science on your side. A new study found that book readers can be more understanding, empathetic, and open-minded compared to TV watchers. Does Reading Fiction Make You More Empathetic? The researchers of the study asked 123 participants about their book, TV, and play preferences and included questions about which genres the participants like, from romance and drama to comedy, fiction, and non-fiction. In addition to these questions, the researchers tested the participants’ interpersonal skills, such as their behavior towards others, their ability to understand others, and whether they help other people. 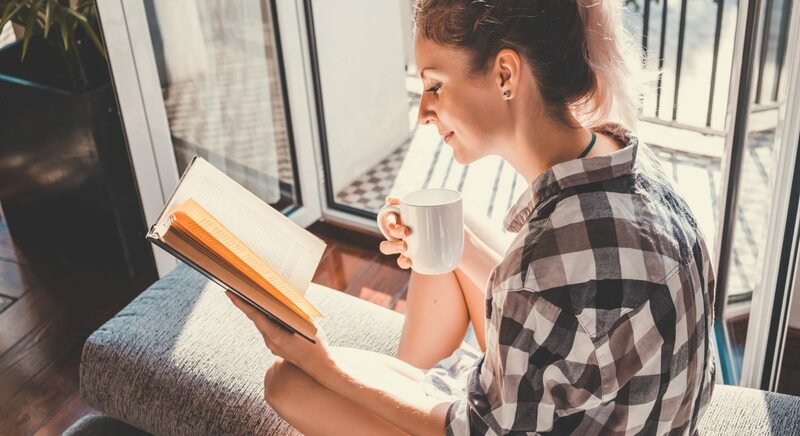 The study found that those who read more books than watched TV were more empathetic, open to different viewpoints, and more sociable. Participants who watched more TV than read books were less friendly and understanding. The researchers noticed differences in the participants’ genre preferences. Watching too much TV is detrimental not only to your interpersonal skills, but also to your physical health. Unless you combine watching TV with a physical activity such as using the treadmill, sitting for a long time in front of a screen can hurt your body and vision. Sitting for prolonged periods of time may have negative effects on your metabolism and heart. Reading a book on an eReader is also significantly different than reading a physical book. eReaders are connected to poor quality of sleep because the light from the screen suppresses the production of melatonin, the hormone that controls your sleep cycle. (9) Electronic reading devices can be useful, practical, and easier to carry, but it would be better to avoid using them before sleep to limit their negative health effects. Regardless of how you like to entertain yourself, it’s all about finding a healthy balance and managing your time. You can watch TV and read books on a device or a physical copy, but remember to take breaks to avoid prolonged sitting and its negative outcomes. Time your TV watching, take a break from reading when you feel tired, and be as physically active as you can, even if all you do is stand and get yourself a glass of water. (1) Bal, P. M., & Veltkamp, M. (January 30, 2013) How Does Fiction Reading Influence Empathy? An Experimental Investigation on the Role of Emotional Transportation. PLoS ONE, 8(1), e55341. (2) Grace, M. S., Dempsey, P. C., Sethi, P., Mundra, P. A., Mellett, N. A., Weir, J. M., Owen, N., Dunstan. D. W., Meikle, P. J., Kingwell, B. A. (March 13, 2017). Breaking up prolonged sitting alters the postprandial plasma lipidomic profile of adults with Type 2 Diabetes. The Journal of Clinical Endocrinology & Metabolism. (3) Larsen, R. N., Dempsey, P. C., Dillon, F., Grace, M., Kingwell, B. A., Owen, N., Dunstan, D, W., (March 24, 2017). Does the Type of Activity ‘Break’ from Prolonged Sitting Differentially Impact on Post-Prandial Blood Glucose Reductions? An Exploratory Analysis. Applied Physiology, Nutrition, and Metabolism. (4) Maducdoc, M. M., Haider, A., Nalbandian, A., Youm, J. H., Morgan, P. V., Crow, R. W. (April 2017). Visual consequences of electronic reader use: a pilot study. International Journal of Ophthalmology, 37(2), 433-439. (5) National Heart, Lung, and Blood Institute. (June 22, 2016). What Is Metabolic Syndrome? (6) Porcar, E., Pons, A. M., Lorente, A. (June 18, 2016). Visual and ocular effects from the use of flat-panel displays. International Journal of Ophthalmology, 9(6), 881-5. (7) Tigbe, W. W., Granat, M. H., Sattar, N., Lean, M. E. J. (May 2017). Time spent in sedentary posture is associated with waist circumference and cardiovascular risk. International Journal of Obesity, 41(5), 689-696. (9) Yoshimura, M., Kitazawa, M., Maeda, Y., Mimura, M., Tsubota, K., Kishimoto, T. (March 8, 2017). Smartphone viewing distance and sleep: an experimental study utilizing motion capture technology. Nature and Science of Sleep, 9, 59-65.